My husband called me when he was almost home from work and told me to grab my camera. He's done this before, when he's found a pic for me. I apologize to the people that had already commented on this pic. I'm a little OCD about my pics and uploading changed the color. I deleted the first pic and fixed my color. 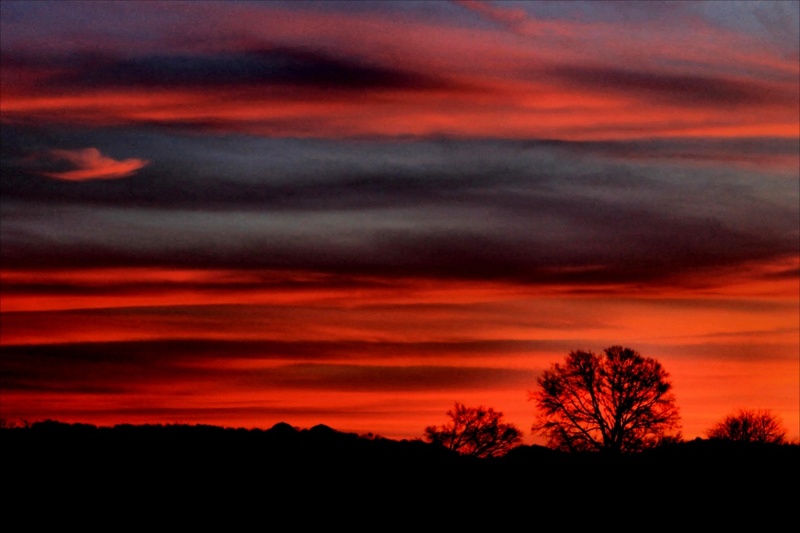 What a beautiful striated red sunset with silhouetted trees. gorgeous! wow what a sunset! Wow - sunset on Mars! Fantastic shot and beautiful, flaming sunset! This is gorgeous, really breautiful! fav! oh my! this is what i was hoping to get last night. Look to the left in the middle...do you see the white cloud? It looks like a white dove in flight. Makes this picture that much more special! the colors are just magnificent! Love a good sunset nicely captured. I know that I commented on this earlier . . and now my comment is gone! That's wild. I remember that your sky was a slightly different shade. Oh well, I repeat . . this is beautiful. In fact it's AWESOME! Stunning! I love the tree silhouettes. LOL!, my husband does that, too! You've captured a fantastic scene here! Great job! my husband does it too:) In this case I'm really glad he called you, this is beautiful!! Awesome capture. Wonderful colours and layers. Oh my, you would not have wanted to miss that one. Man oh man - this needs a frame around it Carolyn - it's spectacular! makes you dream of summer this one does,, your hubby is a fine young man to be calling you like that.. Stunning colours and cloud layers! Awesome hardly says it. Instant fav! wow, stunning capture, awesome husband! Well worth the trip outside in your pj's! Wonder capture. And they fade so fast. If you'd taken the minute to change clothes it would have been gone. Two photos on the Popular page. Both deserving. @annamaker Thank you, Anna Mae! I'm glad to see you back on here! I've been checking your project to see if you've posted. I was a litle worried about you! Wow, such vibrant colours. I love the reds.